Everything you need to know about the Hampton Pirates as they begin the NCAA tournament. The Case For: The Pirates were in a similar position a season ago. In 2015, Hampton survived the First Four, beating Manhattan before slotting in as a 16 seed and losing to the then-undefeated Kentucky Wildcats. Most of last season’s cast returned, led by Johnson who has found his footing in his final year. Johnson was voted Most Outstanding Player in the Mid-Eastern Athletic Conference tournament, notching double figures in all four games. Fellow senior Quinton Chievous ranks in the top 15 nationally in rebounding, averaging 11.0 per game along with 17.2 points. Although the team is small, with no one taller than 6'9", they rank 35th nationally in offensive rebounding. The Pirates have a deep bench with nine players seeing the floor on most nights, giving them fresh legs that other teams can’t match. Hampton has been on a roll lately, dropping only one game since Feb. 6. For the Pirates to make a run, the best they can hope for is to escape the curse of the 16 seed. In fact, as a 15-seed, the Pirates have pulled an upset before—in 2001 they beat Iowa State. Will they be able to repeat? Crazier things have happened in March. The Case Against: Hampton played one of the easiest schedules in Division I this season, ranking 322nd out of 347 teams in strength of schedule. Still, they lost 10 games. The Pirates only matchup with a ranked opponent this year was against No. 18 SMU on Dec. 18, which they lost, 105–72. Despite strong shooting numbers from Johnson and Chievous, the Pirates struggle offensively, scoring just 99.9 points per 100 possessions, or close to once every two times down the court. Hampton also struggles to take care of the ball, turning the ball over an average of 14.1 times per game. The Pirates have only two true three-point shooters in Brian Darden and Johnson, who shoot just 30.0% and 32.0% from behind the arc, respectively. The lack of threats from behind the arc makes the Pirates easier to defend. 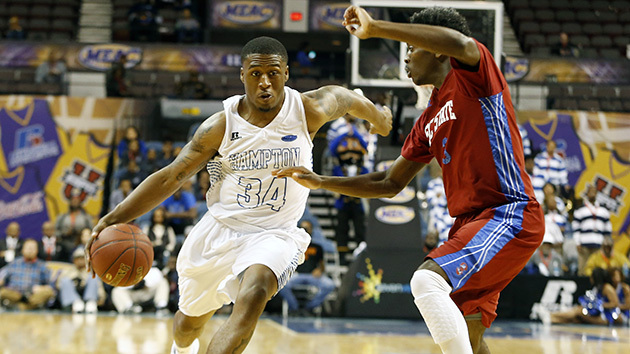 Hampton also struggles from the free throw line, ranking 10th in the MEAC, shooting just 65.7% as a team. SI Prediction: Lose to Virginia in the first round.